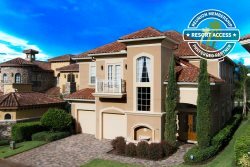 This condo is on the second floor and located in the community of Center Court Ridge in Reunion Resort. It has a playground nearby, and is only a short walk from the Seven Eagles pool and “The Cove” bar and grille. It is also close to the Reunion Grande hotel and clubhouse, which allows access to their selection of restaurants and bars. The dining room and living room are both furnished well and spacious. The living room has a large screened cable TV complete with a DVD player. The dining room is complete with seating for 6 with a beautiful dining table. The kitchen is fully equipped with the latest appliances you would need for your stay. All bedrooms in this condo have brand new mattresses as of June 2017. The first bedroom is a master bedroom that is furnished with a king sized bed with a pillow top mattress. It comes complete with a cable TV, an electronic safe, a spacious walk-in closet, and an en-suite bathroom. The en-suite bathroom is large and includes dual sinks and separate bathtub and walk-in shower. The second bedroom is furnished with a queen sized bed. It has a TV with cable, a roomy closet, and its own en-suite bathroom. The third bedroom has both a queen sized bed and a full sized bed, a large closet, and a TV with cable. It has an adjoining family bathroom. Through sliding glass doors there is a private balcony that comes with a table and seating for 4 along with 2 sun loungers. The condo has free high-speed internet and free local and long distance calls. It also is smoke-free and pet-free. This condo is just half a mile away from the main pool in the resort located at Seven Eagles. The Seven Eagles pool is the most popular within the resort and boasts two relaxing Jacuzzis with plenty of poolside seating. Enjoy poolside refreshments and dining at the Cove Bar and Grill, with a menu of sandwiches, salads, snacks, and smoothies, as well as a full bar. Reunion finest rentals at affordable rates. Accidental Damage Protection of $89 plus tax will be required against any reported damages or loss to this property and its contents. Great stay and would do it again, Nice and clean ... easy access. It was fantastic! Near to Disney and the perfect place to rest! Very relaxing and fun. The balcony was fabulous. We want to tell you that we spent a few fantastic days in the apartment we rented in Reunion. We were very pleased with it, are clean, comfortable and the set is very well located, quiet and safe. Very surely recommend it to other friends and acquaintances who wish to travel to Orlando. We also have found everything in the same condition that we find ourselves. On our next trip to Orlando we will want to be with you again. Just want to thank you for our wonderful stay and Reunion. We loved the condo and the property is gorgeous. Appreciate working with you as well. The Condo was perfect. Everything was above our expectations. We are already planning to come back next year.